Thinking of becoming a Computer Technician? Our CompTIA Computer Technician program is the essential stepping stone for achieving this goal. The IT industry offers a diverse range of careers and credentials that are key for individuals new to the field and IT professionals in transition. Thousands of companies depend on CompTIA standards to provide a consistent predictor of employee success. The CompTIA A+ certification is the starting point for a career in IT and CompTIA Network+ certification is the sign of a qualified networking professional. IT Professionals in A+ and Network + exhibit qualifications to work in areas such as: network technologies, installation and configuration, media and topologies, management, and security. Thinking of becoming a Computer Technician? Our CompTIA Computer Technician program is the essential stepping stone for achieving this goal. The IT industry offers a diverse range of careers and credentials that are key for individuals new to the field and IT professionals in transition. Thousands of companies depend on CompTIA standards to provide a consistent predictor of employee success. The CompTIA A+ certification is the starting point for a career in IT and CompTIA Network+ certification is the sign of a qualified networking professional. IT Professionals in A+ and Network + exhibit qualifications to work in areas such as: network technologies, installation and configuration, media and topologies, management, and security. Candidate job roles include network administrator, network technician, network installer, help desk technician and IT cable installer. CompTIA Security+ certification designates knowledgeable professionals in the field of security, one of the fastest-growing fields in IT. 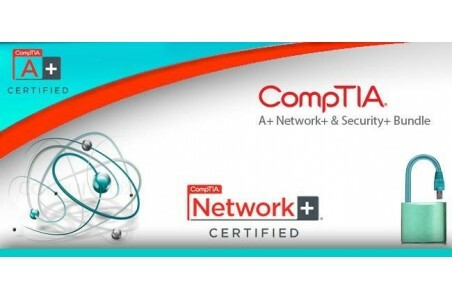 CompTIA Security+ is an international, vendor-neutral certification that demonstrates competency in Network Security, Compliance and Operational Security, Threats and Vulnerabilities, Application, Data and Host Security, Access Control and Identity Management Cryptography.